Relative: I would never vote for [Politician]. His positions demonstrate his lack of sincerity. Me: [Politician] is plenty sincere. I think he strongly believes in those positions. Relative: Well, then he’s just stupid. And there you have the lexicide of troll in a nutshell. Let me explain. Troll used to serve as internet slang for a provocateur – someone who sought attention by posting controversial or contrary sentiments on a message board (e.g., a paean to steak tartar on a vegan website). Eventually, we all learned to ignore them, or not to “feed the trolls.” Since their comments existed only to get a rise out of people, we knew trolls lacked sincerity. Commenter #1: Vote for [Politician]! She understands the plight of the poor! Commenter #2: She was raised in Newport and went to Choate. How does she understand the poor? Commenter #1: Get lost, troll! Commenter #2 is fielding a legitimate counter to Commenter #1’s thesis, but in doing so, she raises an inconvenient truth, hence she is a troll. This lexicide reveals much about the psychology of the commenters who use it. 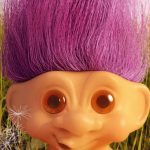 When they label someone a troll, they assert that their opponent is just voicing a conflicting opinion for attention – because no one in his right mind would really believe that claptrap. In other words, whereas troll used to describe one who lacked sincerity, now it describes someone you think is just stupid – because they don’t share your viewpoint. That’s public discourse in America for you – intolerant of diverse opinions and proper word use. Which is worse? I’ll let you decide. This entry was posted in words on August 20, 2013 by mark. Please, feel free to email me privately if you don’t respond publicly. This issue has been one of some frustration me lately! You answered your own question, I think. If you comment “in an environment where that side is not at all welcome”, you can expect your comment to be… not at all welcome. If you know this to be the case, why comment at all? Given the state of internet civility (none), you will change no hearts or minds. The ‘net is a poor forum for this kind of discourse. Better to engage an open-minded member of the other side one-on-one, away from the peer pressure of social media or comment thread.